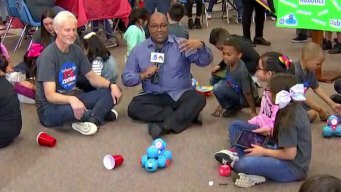 NBC 5's Wayne Carter visited his first elementary school in the Brag About Your School series: Central Elementary in Duncanville. Grapevine-Colleyville ISD's virtual academy helps students involved in elite athletics, acting, or weren't a good fit for the traditional school environment. Districts say many parents still view pre-K as daycare and don't recognize the benefits it offer their children, and the resources available to help children get in the classroom at that age. Wayne Carter is NBC 5's Education reporter covering parenting and school programs throughout North Texas. His "Carter in the Classroom" reports will look at the unique things school districts are doing to help children succeed as well as answering questions parents may have about what's happening in the classroom.